If you’re new to reloading ammo there’s no need to use advanced equipment like turret or progressive presses just yet. With the best single stage reloading press you will learn how reloading works and create bullets along the way. Single stage reloading presses are easy to use and affordable. Some models offer superior performance compared to others, but no worries as I already picked out the top 4 available. More and more shooters are reloading ammo because it saves money, it’s economical and practical. Why buy new ammo boxes when you can reuse them? For these reasons I have decided to do these reviews, and I have also come up with additional information if you want to know more about buying single stage presses. Are you in a hurry to buy a single stage press? Please refer to the table below as it gives you an idea of their features. The individual reviews provide more details. 3 What is a Single Stage Reloading Press? 5 Who Makes the Best Single Stage Reloading Press? 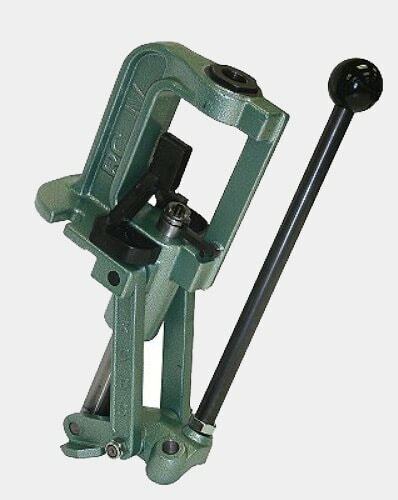 The Rock Chucker is one of the most accurate single stage reloading press available. It is equipped with a compound leverage mechanism for frequent case reloads. The Rock Chucker is ideal for beginners because it is simple to operate, reliable and has the right balance between versatility and usability. The Rock Chucker has a four inch ram which assists the main ram so alignment is always correct. This ram enables reloaders to function properly on various types of calibers, giving it the edge over other single stage calibers. The Rock Chucker also has an ambidextrous handle so left and right hand users will be at ease. The ball grip on the handle keeps you comfortable even wen used for long stretches. The Rock Chucker is compatible with long cartridges and is durable enough to be used on a regular basis. A primer attachment is built in and the press is powerful enough to take on a 338 Lapua and a 300 Win. Shell holders work fine on the Rock Charger and it doesn’t require extensive setup. The primer catch operates smoothly and the other components are just as well made. This single stage press can do hundreds of rounds without slowing down. You can use the press as is or add an automatic primer feeder to improve performance. You can also add a Piggyback 4 later on and turn this into a progressive loader. With these options, expect to use the Rock Chucker for a while. 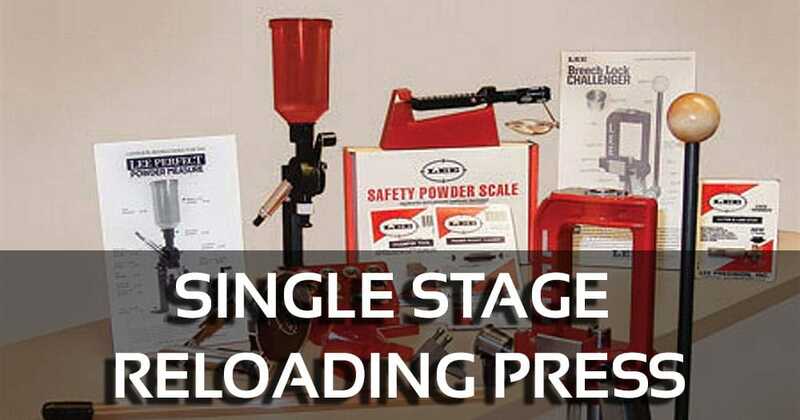 The Lee Precision Classic is one of the more popular single stage reloading press kit products due to its durability and design. This press is built from the same parts used for railroads, and that tells you how strong it is. The reloading function runs smoothly and the steel parts can take a lot of punishment. The Classic sports an O ring design so you can use a wide range of rounds. You could for instance, reload 50 BMG rounds or go small with the 25 ACP. No matter what rounds you are working on, the Classic gives you sufficient clearance to reload in comfort. There are a couple of primer arms included, one for small and large primers respectively. Both are designed to make casings easier. You can remove the primers easily so you can proceed to the next reload stage. The press works with all popular dies and it does not need a lot of adjusting either. The Lee Classic has a light learning curve so you’ll be up and about in a few minutes. It takes in the 1+1/4 X 12 Lee dies and others. You can of course use Lee shell holders, but the press is compatible with RCBS, Hornady and other shell holders as well. The Classic has 7/8 thread bushing built in so you don’t need 380 ACP bushing dies. You can thread the 380 on the Lee and it will take care of the rest. The Hornady Lock n Load was built from the ground up to make you as productive as possible. If you’re looking for a single stage reloading press for accuracy this is as good an option as any. The quick change bushing gives the Lock n Load the advantage as it simplifies operation. This feature reduces the time it takes to adjust dies when you need to replace calibers. The Lock n Load is bundled with 3 die bushings so you can reload immediately. Since you don’t have to make frequent adjustments to the die you’ll be more productive. The Lock n Load sports an angled frame that makes it easy to reload cases. The handle is comfortable and keeps your grip steady during the procedure. The Lock n Load is built out of heavy duty parts. This ensures all reloading levels are supported no matter what bullets you’re reloading. This single stage press does the job as is, but you can attach accessories and expand its functions. Its steel arms and Power Pac linkage increases the leverage applicable to the handle. Together the Power Pac linkage and the steel arms make case resizing quick, minimizing hand fatigue as well. Its Positive Priming System allows you to add primers quickly. The PPS puts the primer at the bottom of the stroke and automatically aligns for optimum feeds. Hornady made its mark by making quality products, and the Lock n Load is up there when it comes to accuracy and durability. The Challenger single stage reloading press for pistol is for reloaders who want maximum value and efficiency. The press is durable, versatile and can handle tasks that ordinary presses cannot. Its O frame gives you ample space to do the reloading. The two priming arms also come in handy when you work with large and small bullets. A used primer container is integrated to speed up work. With its Breech Lock Quick Change feature you no longer have to constantly adjust dies. This feature leads to easy die swapping during reloads. This feature comes in handy when you’ve got several calibers that would normally make rotation hard. The Lee press is compact, but don’t let that mislead you since this is designed for extensive use. You can use the Lee press out of the box but it’s just as easy to add accessories to enhance its functions. The shell holders are easy to attach: just set them on the ram and it’s good to go. Performance wise the Lee press can handle up to a 30.06 as well as the 223, 273 and other calibers under the 50 BMG. You can also use this to swag different calibers. The process is the same so it’s easy to figure this out quickly. You can use a powder measure and a primer feed to boost reloading. Whether you use the Lee press as is or add attachments, it’s still going to be easy to use and needs little maintenance. What is a Single Stage Reloading Press? A single stage reloading press is the most basic reloading press. It performs one function at a time when you pull the handle. The die you use determines what function a single press does. Single stage presses are inexpensive and easy to use, which is why it is suitable for new or occasional reloaders. Single stage presses are suitable for doing brass batch work. Since these presses are simple to use you can do 200 to 300 cases in a single session. In addition these presses show you how reloading works. Before you start looking for the best single stage reloading press for beginners you need to have a criteria to guide you in your purchase. A good single stage press should be made of cast iron, steel or other durable parts. This is especially important for the frame as it provides structural support. A comfortable handle is a must if you’re going to reload for long stretches. A smooth ball grip is the most popular design and reduces hand fatigue. An ambidextrous handle is preferable. The best single stage reloading press for 9mm can do a lot but it does have limitations. If you see yourself doing some heavy reloading in the future, there are some single stage presses that can be upgraded to a progressive press. A well designed single stage press has sufficient clearance for reloading. There also needs to be a good deal of ram bearing surface to keep the reloading press stable. The 0 frame design is one of the most widely used as it is sturdy and spacious. Check the frame construction before buying. You can buy a standalone press and purchase the accessories later. For beginners however a complete kit is preferable as you can start to use it right away. The faster you can change the dies the more bullets you’ll be able to reload. The process varies from press to press, but all the good ones simplify die changing. A die changing system also reduces the amount of adjustment you need to do. Look for single stage press that gives you clearer access to the case. Accessibility also refers to how easily you can access the press features. Value is determined by how easy the single stage press is to use, how durable it is and the benefits it provides. A good press also includes useful accessories and utilities so you can reload faster. Buy your single stage press from reputable companies only. Doing so gives you assurance the product is well designed. Who Makes the Best Single Stage Reloading Press? There is no lacking of brands that manufacture quality single stage presses. However the most consistent has been Lee, RCBS and Hornady. All three companies have been around for decades, and even though the competition is stiff they’ve maintained a loyal following. And the reason for that is they’ve kept the quality high and continue to improve. The 4 single stage presses here do a fine job, but for the most value for your money and time, I would recommend the RCBS Rock Chucker as it comes with a lot of good without being difficult to use. 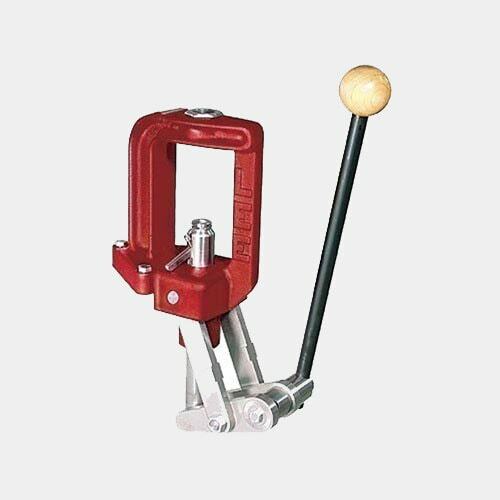 The Rock Chucker removes a lot of the complexities that come with single presses. Its 4” ram provides excellent support and its versatility level is hard to match. 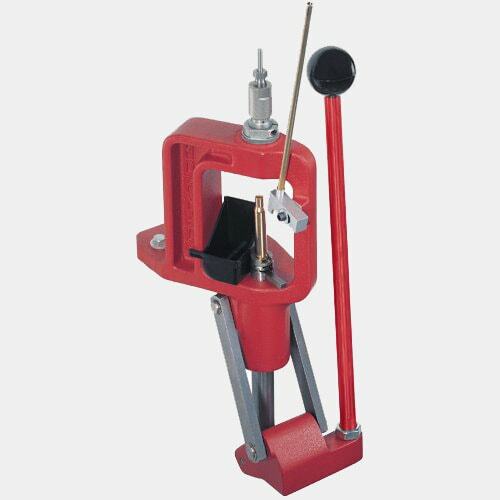 The Rock Chucker is advertised as a do it all single reloading press and I have to agree. From the comfortable handle to the way it works with different calibers, the Rock Chucker is indeed the best single stage reloading press.